Channeling Petey's excessive energy in positive ways will calm him down. If you own a hyperactive pit bull that needs more than a stroll in the park to relax, you may be looking for ways to make him settle. While dogs do not sip on chamomile tea or do yoga, there are strategies to calm your pit bull's rowdy behaviors. Understand the needs for exercise and mental stimulation of this breed. Pit bulls were selectively bred to be general all-purpose dogs. Besides being used for bull-baiting and fighting, these intelligent dogs were also utilized for herding cattle and sheep and as faithful guardians. It is normal for your pit bull to be looking for a "job" and act restless, hyper and frustrated should he remain unemployed for most of the day. Making sure your pit bull has regular opportunities to vent his energy will make him more manageable: a tired dog is a good dog. Invest in a long line. Unless you own a farm with lots of acreage, chances are high your pit bull does not get an opportunity to romp around as needed. Farm-deprived dog owners can use a 50-foot line to grant a 100-foot stretch for their dogs to run back and forth and "work their jollies off," Pat Miller, a dog trainer, behavior consultant and author, suggests. Maximize your pit bull's walk by incorporating a doggie backpack. The extra weight will give your pit bull a "job" while allowing him to slow down and drain some energy. Make sure to get your pit bull gradually adjusted to wearing the pack a few minutes each day and then start loading it up equally on both sides with a few lightweight items. Reward precious moments of calm. You may find yourself often scolding your pit bull to stop him from engaging in unwanted behaviors, but what about rewarding all the good behaviors? Arm yourself with treats, stand perfectly still in front of your dog and watch what he does. Typically, he will go through his entire behavior repertoire of wiggling, jumping, waggling, circling, twirling, licking, pawing, backing up and barking, but he will eventually sit or lie down, veterinarian, animal behaviorist and dog trainer Ian Dunbar explains. When this happens, praise your dog and reward immediately. Then, take a big step to reactivate him and repeat the sequence. As your dog gets good at this, delay giving the reward for progressively longer sits and lie downs and repeat in different places with different distractions. Put your pit bull's nose to work by teaching him the "find it" game. Get a handful of kibble and toss it around the home or yard and tell him to "find it." You can then upgrade the game by hiding the kibble in harder and harder places. By working for his dinner, your pit bull will get some well-deserved exercise and mental stimulation. Best of all, nose work can be quite a tiring activity. 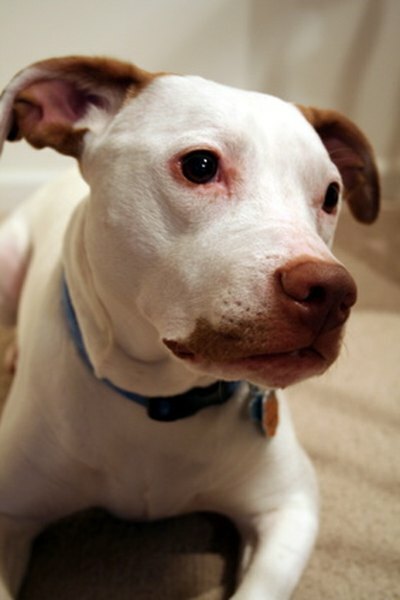 Train your pit bull to practice some impulse control. Hyper dogs are often unknowingly rewarded for their pushy behaviors. If your pit bull jumps up at you, ignore his behavior and only give him attention when he is on all four paws. If your pit bull bolts out the door, train him that he only gets to go out when he is waiting. If your pit bull is impatient when he sees his food bowl, put it down only after he is calm. If your pit bull pulls on the leash, stop and move ahead only when the leash is slack. By rewarding calm behaviors, your pit bull will learn that pushy behaviors yield nothing while polite behaviors yield almost everything. Fill up a Kong or some other keep-busy food dispenser for some quiet time. When you need a break, an interactive toy can provide minutes to hours of peaceful engagement. A Kong can be stuffed with a variety of treats, creamy concoctions and can even be frozen for a refreshing summer treat. Enroll your pit bull in a dog sport. A pit bull can make a fantastic partner for many canine sport activities. Find a sport or activity both you and your pit bull really enjoy; the possibilities are quite vast. Whether you are competing in agility, exploring the field of search-and-rescue or trying some dock diving, you will be rewarded with a stronger bond and your pit bull will make a much calmer and happier companion. Allow your pit bull to get rid of pent-up energy before training or going for a walk. Make daily walks a part of your routine. Organize structured play dates with other dogs your pit bull gets along. Enroll your pit bull in classes so to teach him basic manners. Soft music, pheromone diffusers and massages may help calm your pit bull down. Give your pit bull a predictable routine; dogs enjoy structure and consistency. Minimize the chances for your pit-bull to rehearse unwanted behaviors over and over. Yelling, excited voices or erratic movements will increase your dog's agitation. Make sure your spouse and guests are all on the same page when it comes to training. Avoid training your dog when he is in "hyper mode." Chances are high he will not listen because he is less capable of thinking clearly. Will an Insurance Company Insure a Home Where Pit Bull Dogs Live? What Age Do Puppies Calm Down?